Full Day Excursions in the Okanagan where you'll enjoy a medley of a Private Boat Charter or Sunset Cruise on the Beautiful Okanagan along with a Myra Canyon walking tour and Private Lunch, Picnic or Dinner. What to Bring on your Full Day Excursions. Towels, Sunscreen, Sunglasses, Swimwear and Casual wear. Comfortable walking shoes and a Camera. Experience breath-taking views of Myra Canyon, the Okanagan Valley and Lake Okanagan from historic mountainside train trestles while walking along the gentle grade of the historic Kettle Valley Railroad featuring trestles up to 180 feet (55m) tall and 722 feet (220m) long. An absolute engineering marvel to be experienced first-hand! 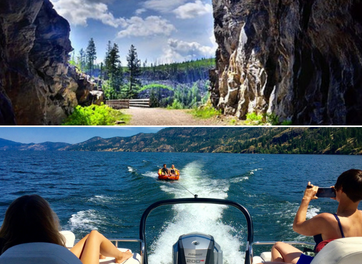 Cheers Okanagan Tours is delighted to offer you a choice of relaxing, leisurely half-day, full-day, multi-day or customized top-tier tours. On top of that we offer fully customized tours that can include blending wine tours with other top Okanagan attractions such as Myra Canyon and high-octane boating or relaxing cruises on Lake Okanagan. Cheers Okanagan Tours and Luxury Lake Tours are the perfect match. Because we share exemplary 5-star reviews by travelers on TripAdvisor that authenticates both company’s commitment to safety and once-in-a-lifetime guest experiences. -Eric O'Sullivan, Sherwood Park, AB. Wine Tour / Boat Tour Combo! Bachelorette party of 9. What could be better than a fabulous wine tour and an amazing boat tour?! Captain Rob was a great host. Highly recommend this activity! See Lake Okanagan on the best boat with the best captain. Rob is a TOTAL PRO. Safety first, meaning the entire family was able to relax, have fun and learn. This experience was so much better than renting a boat and driving around the lake. Rob is the perfect captain and host. He knows boats and his water toys are a blast. Book this charter!